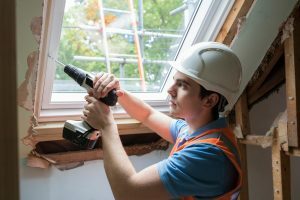 Replacing old, drafty windows with new, energy-efficient ones enhances your home’s beauty and value and lowers your heating and cooling costs. Piscitello Home Center sells a diverse selection of windows for houses at our Easton, Pennsylvania, retail location. Our residential windows meet or exceed Energy Star ratings and are manufactured by some of the top distributors in the industry. Whether you’re building a new home or updating an existing one, let us help you select the windows that best suit your home, lifestyle and budget. Windows add to your home’s character and are also essential for allowing light and fresh breezes indoors. Selecting the right windows for your home often depends on where they’re installed and their overall purpose. Each type of window offers unique benefits to accommodate specific needs. Awning windows are ideal for ventilation, even during light rainstorms, and they reduce air conditioner usage in mild climates. Bay windows combine three windows of varying lengths, which creates a stylish exterior and a feeling of spaciousness in small interiors. Bow windows come in various combinations of four or more fixed or ventilating windows to create a smooth curve, which gives rooms new dimension and style. Casement windows swing in to allow exterior pane cleaning from indoors and stop costly drafts with two continuous weather stripping seals around the perimeter. Double-hung windows offer a tilt-in feature for indoor cleaning of exterior panes and superior air ventilation. Egress windows increase light and ventilation in bedrooms and finished basements, while providing the emergency escape route required by building codes. Garden windows offer plentiful light on four sides, making them ideal for over-the-sink installations or growing plants indoors. Hopper windows swing inward from the top, making them popular in smaller rooms that require better ventilation. Picture windows open up your living spaces. Horizontal slider windows open by sliding to the left or right, making them easier to open than crank-style windows and ideal for rooms facing porches or patios. Homeowners in and around the Lehigh Valley and western New Jersey have trusted Piscitello’s for their home improvement needs since 1958. Visit our Home Center and let our professional staff help you choose the best window style for your home, or contact us today at 610-258-0441 for answers to all your window replacement questions.